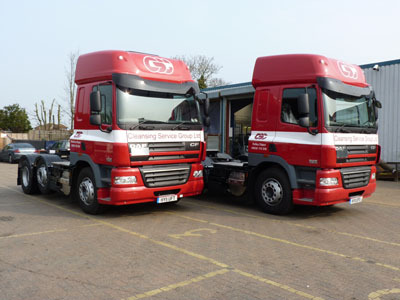 Waste haulage and disposal specialist Cleansing Service Group (CSG) has taken delivery of three new top of the range DAF trucks. Valued at £250,000, the new vehicles are two DAF CF85 tractor units fitted with 12.9 litre 460hp power units and advanced As-Tronic gearboxes. The CF85 was recently voted Fleet Truck of the Year. The third vehicle is a DAF LF55 rigid with a 250hp engine. The LF55 is fitted with a 2,000 gallon (9,000 litre) sewage tank built and assembled by Crossland Tankers in Northern Ireland. All three vehicles comply with Euro 5 and EEV emission standards. Fareham-based CSG is one of the UK waste industry’s fastest growing companies and was recently placed 24th in the latest annual Sunday TimesPwC Profit Track listings, which rank the UK’s 100 private firms with the fastest growing profits. The company is the UK’s leading liquid waste collection provider.